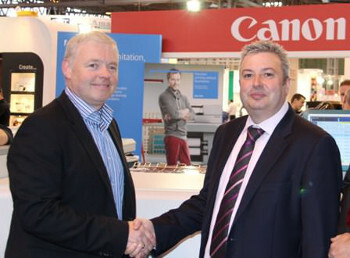 There were happy smiles all round at Sign & Digital UK 2014 for Canon after the company got off to a flying start as the UK's first Océ ColorWave 900® was purchased on-stand by London-based print specialist, Online Reprographics. With a core business centred around providing digital print services to architectural and design clients, Online Reprographics plan to be at the forefront of a developing market with the new technology where full colour, architectural drawings and POS materials can be delivered both quickly and cost effectively. "Being an early adopter of the ColorWave 900 is a strategic move for us," said John Foy, Sales and Marketing Director, Online Reprographics. "Currently, the cost and speed of turnaround of full colour prints in the construction industry is prohibitive for many, meaning customers opt for black and white simply because it is cheaper and quicker to produce. But building plans and planning applications are designed in colour for a reason and we want to make colour print more accessible, improve turnaround times for customers and, importantly, expand our business into new markets with the benefits the machine can offer. "Because we will be able to print in an hour what other printers will only be able to offer in 3-4 hours, we will instantly become more attractive to our customers. Cost does come into it, but time can be of the essence in this industry too. Where others may need to receive print files at midday for 5pm delivery, we can potentially offer a deadline of 3pm - and those three hours can be critical," added Foy. The Océ ColorWave 900 has a width path of 42" (106.2cm) and a raw print speed of 1,100 m2/h. The machine incorporates the same six media roll capacity of the Océ ColorWave 600/650 devices with an input capacity of 1,200 metres (200 metres per roll). "We see an opportunity to expand the business further into the exhibition and retail arenas as a result of this purchase,” continued Foy. "Customers are often asking for prints to be turned around urgently - particularly local businesses who may need last-minute posters and POS materials printed there and then. With the speed offered by the ColorWave 900 we will be better positioned to serve these customers and continue to diversify our business - just one element of this being our new online offering which we envisage enhancing our market reach and customer base significantly." The company, celebrating its 10th anniversary in May, has close ties with Canon - formerly with Océ – which has spanned this decade with the installation of various wide format printers and software. Over the last past five years it has operated two ColorWave 600 machines and believes the key to this has been the excellent support and expertise of Canon. "Anyone can buy a machine, but in my view only Canon has the proven track record for wide format equipment of this nature. Trusting the service and support of a manufacturer is key, particularly when we are going to be the first to offer the benefits of the ColorWave 900 in the UK. We are confident that we can raise the bar in the industry with this technology and allow our customers to push their boundaries and reap the benefits," said Foy. "Online Reprographics is a progressive company that has the foresight to plan for growth with the shrewd use of technology," said Duncan Smith, Director of Wide Format Group, Canon UK. "The company has a clear plan for how it can tap into new markets and better serve its current clientele and we look forward to supporting them as they see these plans come to fruition."